Top Crop has been producing high-quality horse haylage on the Lincolnshire coast since 1998. It is made from purpose-grown, weed free, two year ryegrass seed leys, grown on drought-resistant heavy clay soils that are ideal for grass growing. The ryegrass haylage is made from three consecutive cuts from June to September. The 1st cut usually has the highest feed value for extra condition and demanding work, the 2nd cut for medium work and 3rd cut the lowest, for light work ponies and laminitics. A smaller proportion of our stock is produced from traditional old meadows for a slower release ‘quieter feed’. We aim to make a haylage of consistent quality of around 70% dry matter. 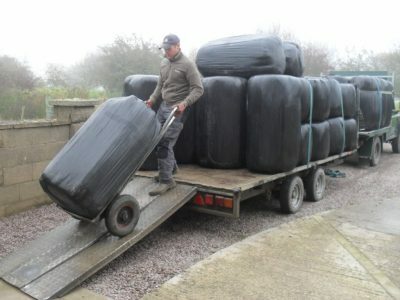 In order to achieve this we have a dedicated and experienced team who are involved with every stage of the process, from planting grass seed to delivering bales on your yard with great care. Most of our sales are direct to the end user, but we also supply a number of retailers who rely on our consistency of product and reliability of service to maintain their customer base. As well as horses, we also supply customers feeding sheep, goats and reindeer and are always happy to supply haylage for annual events like pony club camps etc. Topcrop always welcomes the opportunity to sponsor equine events in Lincolnshire and neighbouring counties. Top Crop has been producing high-quality horse haylage on the Lincolnshire coast since 1998. We supply direct to the end user as well as to a number of retailers. Copyright © 2017 - 2019 Top Crop Haylage. All Rights Reserved. A website by The Pixel Fairy.